A laparoscopy is a type of surgical procedure that allows a surgeon to access the inside of the abdomen and pelvis without having to make large incisions in the skin. It is also known as keyhole surgery. t source and a camera. The camera relays images of the inside of the abdomen or pelvis to a television monitor. What is a laparoscopy used for? A laparoscopy may be used to diagnose or treat many different conditions. Small surgical instruments and devices can be attached to the laparoscope to perform surgical procedures. It is often possible to diagnose a condition using non-invasive methods, such as an ultrasound scan, a computerised tomography (CT) scan or magnetic resonance imaging (MRI) scan. However, sometimes the only way to confirm a diagnosis is to directly study the affected part of the body using a laparoscope. A laparoscopy can also be used to diagnose certain types of cancers. In such cases, the laparoscope is used to obtain a sample of suspected cancerous tissue so that it can be sent to a laboratory for testing. This is known as a biopsy. A laparoscopy is performed under general anaesthetic, so you will be unconscious throughout the procedure and have no memory of it. You should be able to go home on the same day. Depending on the type of laparoscopic surgery being performed, you will usually be asked not to eat or drink anything for 6 to 12 hours before the operation. If you are taking blood-thinning medication (anticoagulants), such as aspirin or warfarin, you may be asked to stop taking it a number of days before surgery. This is to prevent excessive bleeding during the operation. Most people can leave hospital either on the day of the surgery or the following day. You will usually be advised not to drive for at least 24 hours after surgery, so you will need to arrange for someone to drive you home. 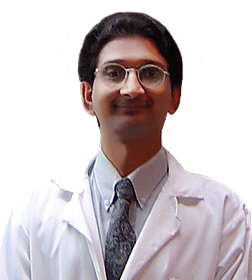 Dr. B C Shah will make a small incision of around 1–1.5cm (0.4–0.6 inches) near your belly button. A tube is inserted through the incision and carbon dioxide gas is pumped through the tube to inflate your abdomen. Inflating your abdomen allows him to see your organs more clearly, and gives him more room to work. A second small incision will be made so that the laparoscope can be inserted into your abdomen or pelvis. The laparoscope will relay images to a television monitor in the operating theatre, giving Dr. B C Shah a clear view of the whole area. If the laparoscopy is used to carry out a surgical treatment, such as removing your appendix, further incisions will be made in your abdomen. Small, surgical instruments can be inserted through the incision, and Dr. B C Shah can guide them to the right place using the view from the laparoscope. Once in place, the instruments can be used to carry out the required treatment. After the procedure, the carbon dioxide is let out of your abdomen, the incisions are closed using stitches and a dressing is applied. Laparoscopy used to diagnose a condition usually takes 30–60 minutes to perform. It will take longer if Dr. B C Shah is treating a condition, usually 30–90 minutes, depending on the type of surgery being carried out. After a laparoscopy, you will feel groggy and disorientated as you recover from the effects of the anaesthetic. Some people experience symptoms of nausea and vomiting. These are common side effects of the anaesthetic and should pass quickly. You are likely to feel mild pain at the site of the incisions in your abdomen, so you will be given painkilling medication. These symptoms are nothing to worry about and should pass after a day or so once your body has absorbed the remaining carbon dioxide. Before you leave hospital, you will be told how to keep your wounds clean and when to return for a follow-up appointment or to have your stitches removed (although dissolvable stitches are now often used). If you have had a diagnostic laparoscopy, you will usually be able to resume your normal activities within five days. The recovery period after a therapeutic laparoscopy depends on the type of treatment. After minor surgery, such as appendix removal, you may be able to resume normal activities within two weeks. Following major surgery, such as removal of your ovaries or kidney due to cancer, the recovery time may be as long as 12 weeks. Dr. B C Shah can give you more information about when you will be able to resume normal activities. 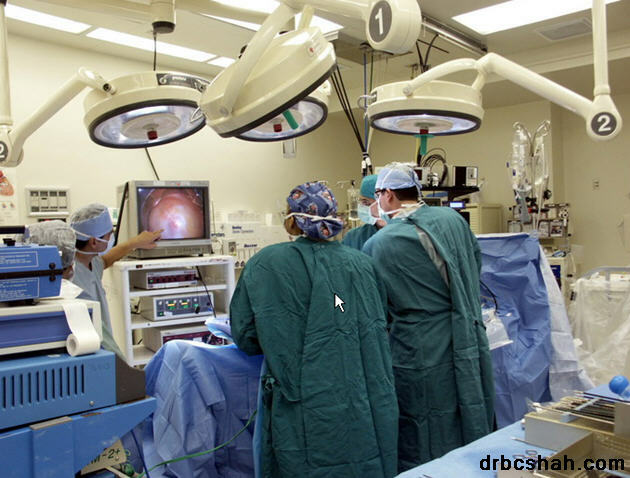 Laparoscopy is a commonly performed procedure and complications are generally rare. Further surgery is usually required to treat these major complications.